Schools are gradually becoming more girl-friendly in northwestern Bangladesh, thanks to the interventions of the Best Schools for Girls campaign. Last month, 18 Women and Girls Lead Global film facilitators in the Nagaon district gathered for a two-day retreat to share stories about the changes that schools in their area have implemented since the campaign officially launched in October 2013. 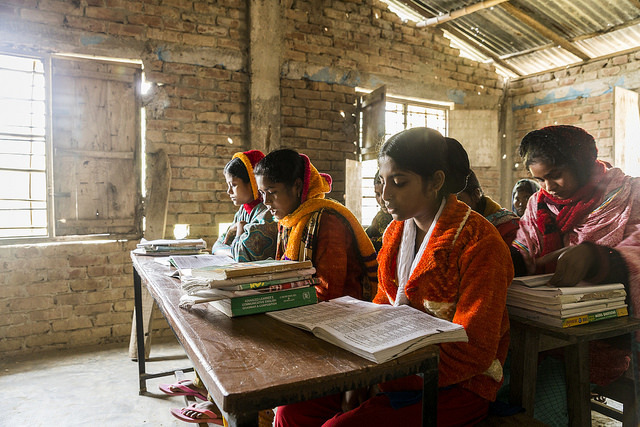 WGLG Bangladesh’s Best Schools for Girls campaign aims to prevent child marriage by creating safer school environments that nurture girls’ success. WGLG facilitators take on the challenging but exciting task of working with schools to make much-needed changes to their programs. Facilitators and schools work together to keep girls enrolled and high-performing, to give them greater opportunities to develop skills and leadership abilities through extracurricular activities, and to ensure their safety at and on the way to school, among other things. In Bangladesh the harassment of girls and women – on the street and in other public spaces – is referred to as “eve-teasing,” and it’s one of the issues that worries parents most about sending their adolescent girls to school. In response to a WGLG screening event at Chokhsreepur High School, a group of boys decided to form a committee to prevent this kind of sexual harassment at their school. One day while gathered near a classroom window, they witnessed two girls being harassed on their way to school and they ran to the aid of their friends. The boys then approached their teachers to take further action. School administrators called a meeting to discuss the affair, and 350 community members showed up to propose solutions. Students and teachers have formed similar committees at Kanta Ksmot High School and Bokroil High School, where the groups have established formal complaint systems for students to report eve-teasing.